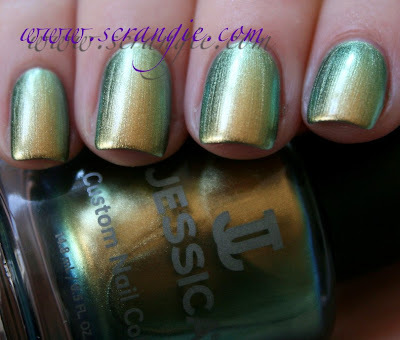 Jessica's Peacock Queen collection was actually released in Fall 2011, but somehow I never noticed it until this spring. It's a small collection, only three shades, but that's okay. 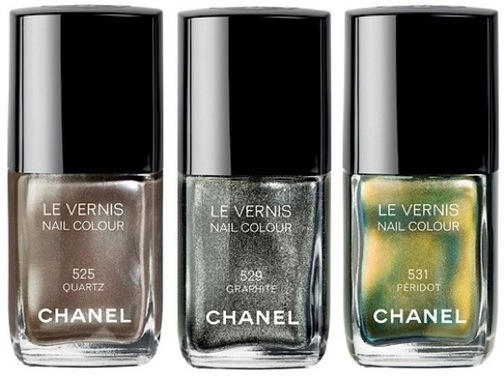 If the shades seem familiar to you, it's because they're duplicates of the Chanel Le Vernis Fall 2011 collection shades, except for less than a third of the price per bottle. Jessica Bronze Tailed. This is a light mousy brown/taupe frost. The frost is very silvery and fine but also has some larger speckles of shimmer that stand out against the base color. Truthfully, I don't understand the appeal of this color. I didn't like it when Chanel did it, and I don't like now that Jessica has done it. Frosty, murky, faded brown? No thanks! 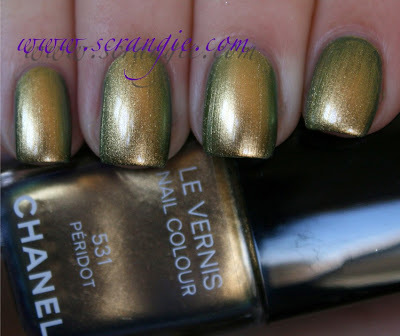 But, if you're looking for a less expensive version of Chanel Quartz, this is your polish. Jessica Iridescent Eye. Now this is fantastic. It's a metallic, near-chrome finish polish. The main color of the polish is a shiny golden olive. 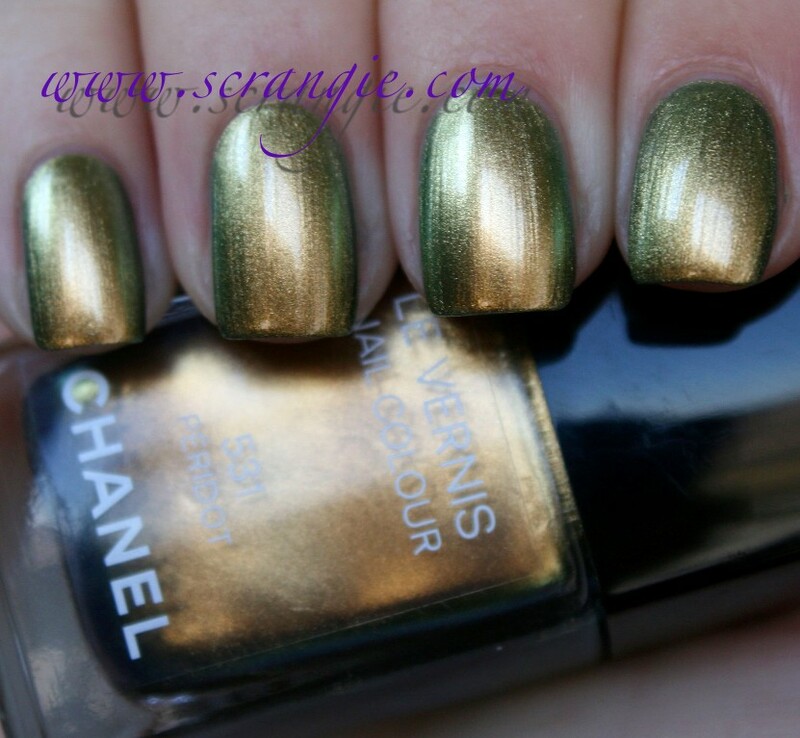 But, with light changes in angle or lighting, the polish will flash green, teal, blue, brighter gold and yellow and even a hint of orange. Jessica Smoky Feather. 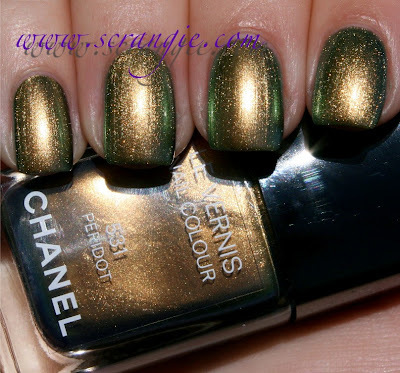 This is a chunky multicolor shimmer. The main color is a graphite grey but it also has chunky flecks of gold and dark silver. It has a very textured, almost glittery look, but it's actually completely smooth, not gritty at all. It is very sparkly in the sunlight. This is a match to Chanel Graphite. I know I already posted a Chanel Peridot comparison here, but I took a few more pictures of just Peridot and Iridescent Eye together to show how similar they are. Here's Jessica's collection: Bronze Tailed, Iridescent Eye, Smoky Feather. Here's Chanel's Le Vernis Fall 2011 Collection: Quartz, Graphite, Peridot. The formula on these was fantastic. None of them gave me even a hint of difficulty. They were extremely smooth, flowed evenly without dragging or pooling, and were just all around wonderful. Best Jessica polishes I've used so far- normally they feel thick to me. The drying time on these was longer than average, but not unbearable. I did three coats of each in these pictures. Is this an original collection? No. Is it a blatant knockoff of the Chanel Fall collection? Yes. Am I upset about that? No way! 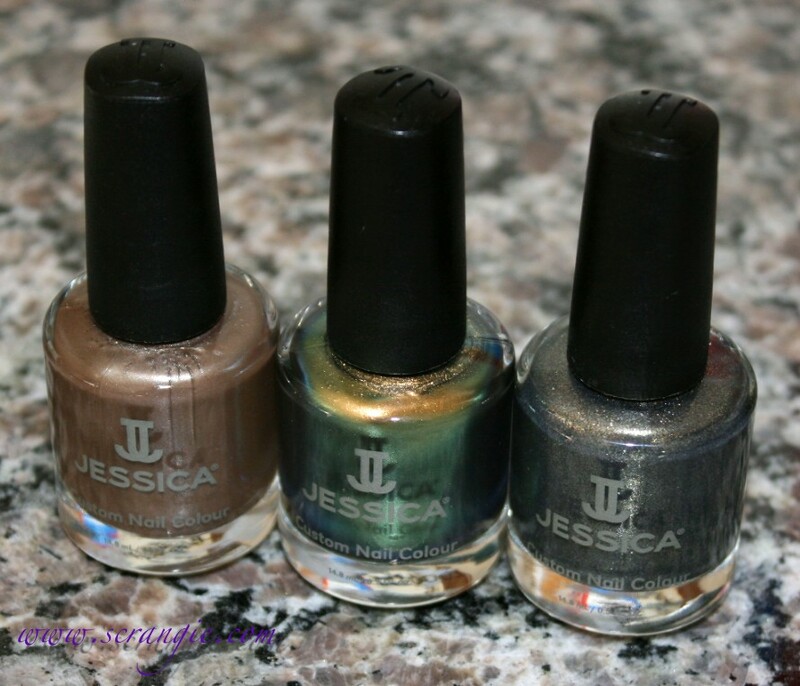 These have great formula and application, the colors seem very true to the originals and you can buy the entire Jessica collection for less than the price of one of the Chanel polishes. I'm very happy about that, especially since I've been considering buying a backup of Peridot, but couldn't bring myself to spend $52 on two bottles of polish. Same look, better formula, better price. I can't complain about that! These are available now on jessicacosmetics.com. 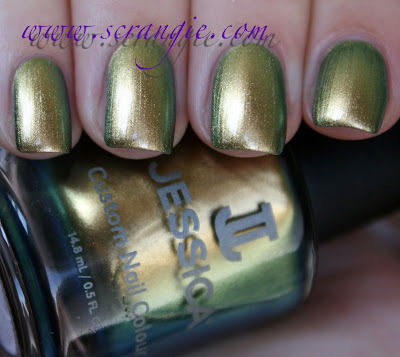 I just bought Iridescent from NinjaPolish since Jessica's website was sold out of it (or at least it didn't even show up when I searched for it). I'm excited to have a Chanel dupe at such an affordable price. These are all seriously pretty though, I may have to go back and get the others as well. I'm def getting Iridescent, but I can't decide on the other two... Great swatches as always - very much appreciated! I wanted a backup bottle of Peridot SOOO bad but didn't want to spend $50+ on ONE color of polish, and I was SUPER happy when I saw Jessica came out with these! I don't care if they blatantly copied Chanel... on the contrary, I'm just relieved to have my backup now! 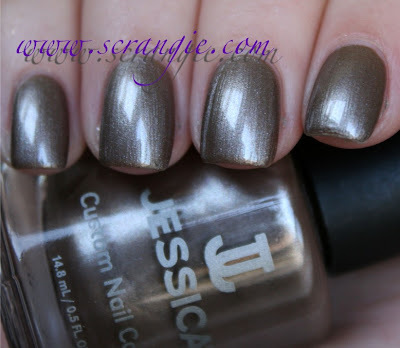 Wow Jessica NAILED that dupe! I'm not cheap when it comes to nail polish. But I really can't convine myself it's ok to spend $50 on a nail polish. Jessica doesn't seem that cheap either (sure, it's cheaper than Chanel, but still pretty expensive). Not such a big fan of Peridot/Iridiscent Eye but if you are...a pretty good (and dirt cheap) dupe is Sephora - Diving in Malaysia. Hm, I was under the impression they were about 20 bucks each :) Read it somewhere on a blog. But now that I think about it...maybe it was a kit? Well, 7.50 is a decent price for a polish. I'm thrilled about this collection. I wanted Chanel's Graphite but was not going to pay the price. I did by Peridot and wished I could have a backup. Now I can! Jessica Iridescent Eye is gorgeous! I want it! I have Iridescent Eye on my nails right now! I love it!! !